After Sean Thompson publicly pied Kevin Johnson, the ex-NBA superstar turned disgraced mayor of Sacramento, Thompson said he wanted his day in court. Looks like he might end up with more than he bargained for: On the fifth day of deliberations after a week-long trial, a jury in Sacramento Superior Court told Judge Robert Twiss they were hopelessly deadlocked on both a felony charge of assaulting a public official filed against Thompson and a second misdemeanor count of committing battery on school grounds. Judge Twiss quickly declared a mistrial. The case grew out of a September incident at a gala held on the campus of Sac High, a school in the St. HOPE chain of charter schools founded by Johnson in his hometown. Thompson, a political activist of some renown in the California capital, hit the then-lame-duck mayor in the face with a coconut cream pie in front of a crowd. Johnson responded quickly and violently, grounding and pounding Thompson. Thompson received injuries to his head and face that required stitches during the pummeling. Johnson, who called police a day after being pied to report that he’d pulled his groin while punching Thompson, was not charged. Thompson had claimed after his arrest that the pie was not thrown with any intent to harm the mayor physically but was instead meant to embarrass him for what the baked goods hurler saw as Johnson’s shortcomings as a public servant. Apart from the elongated deliberations—five days for a thrown pie?—the proceedings never devolved into the circus that many Sacramentans anticipated, given how pretty much everything around the Johnson had a whiff of wackiness in his last year in office. The proceedings had some lighter moments, such as when a clique of Thompson supporters showed up in court wearing “The People’s Pie” t-shirts, only to have Judge Twiss order them to turn the garments inside out. But the trial’s expected center-ring attraction, Johnson, never appeared in court. White told Deadspin before jury selection that her client hoped his side would have the opportunity to question Johnson under oath on such issues as the treatment of homeless people in Sacramento during his mayoralty, the directing of hundreds of millions of dollars of public money to the construction of a new downtown arena for the Sacramento Kings, and the sexual abuse accusations lodged against Johnson through the years. But according to White, Johnson successfully avoided all attempts by Thompson’s side over the last several months to serve him. White said she also intended to compel testimony from Johnson’s wife, fellow charter school zealot Michelle Rhee, who was with her husband when Thompson weaponized the baked good. Rhee, however, somehow avoided service just like the ex-mayor. Johnson had a huge and constant media presence until his political career was derailed by a string of scandals that grew out of his alleged administrative and sexual malfeasance. He has been publicly invisible since leaving office late last year, other than when he was yet again denied induction to the Naismith Basketball Hall of Fame, and when he took what is described as a part-time job with Independent Sports and Entertainment, a sports management firm. Rhee has likewise shunned lately the limelight she once craved. For example, neither Johnson nor Rhee, who serves as chairman of the board of St. HOPE, made any public comment after a majority of teachers at the chain’s schools recently voted to unionize. Johnson and Rhee, like most charter advocates, are viewed by teachers unions as vehement opponents of organized labor. White also hinted before the trial that Thompson might try to argue in court that his pie throwing was a protected form of free speech, which a pair of criminal defense attorneys consulted by Deadspin described as a strategy with no legal precedent. 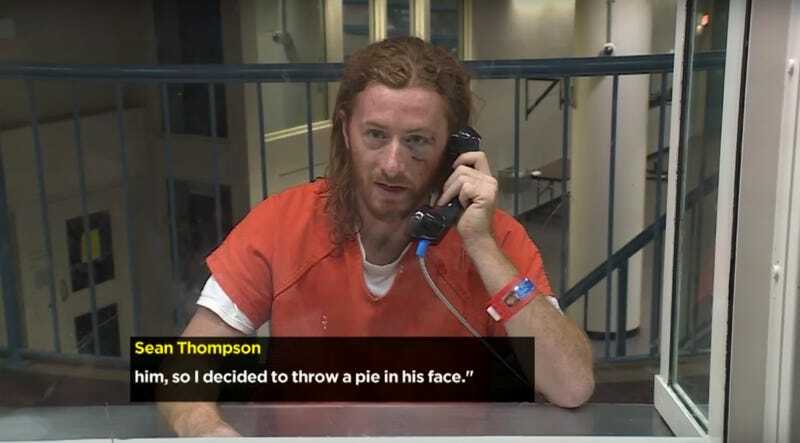 Without Johnson in court, however, Thompson decided against attempting the pie-as-speech tack, and didn’t even take the stand in his own defense. White made the absentee Johnson’s violent response to being pied, and his failure to face the accused in court, major parts of the defense. Will The First Amendment Save The Kevin Johnson Pie Bandit? “There was a pie, a pause, a wipe and a beating,” White said in her closing arguments on Tuesday, according to the Sacramento Bee. But even with that seemingly low bar for conviction, on Thursday morning, jurors sent Judge Twiss word that they were unable to reach a verdict. Twiss sent the jurors back into the jury room on Thursday afternoon with orders to keep trying to reach a consensus. When they came back with the same message this morning, the judge ended the trial. Given the history of accusations made against Johnson long before he ever took a pie to the face, that seems a very reasonable question. After the mistrial was declared, White said that the DA’s office will announce whether retry the case by June 8. A second trial would give Thompson more chances to subpoena Johnson, and could serve as the last chapter of the scandal-plagued mayoralty of the fallen former hometown hero. So maybe the circus will show up after all.